Electric car sharing is coming to Esporles! 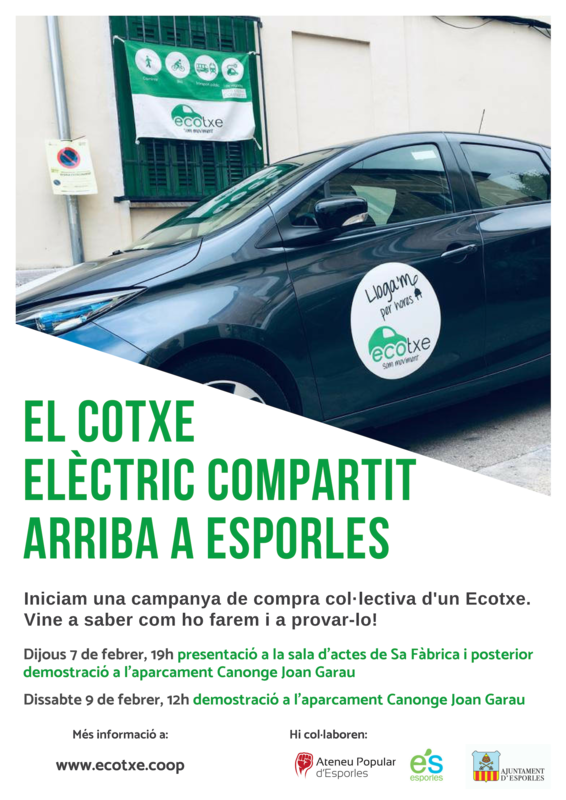 Ecotxe is an electric car sharing co-op that started in Palma de Mallorca. In the city our members can access our two vehicles located in the municipal SMAP car parks on Via Roma and Parc de la Mar. However, congestion and pollution are problems that not only affect Palma, but the entire island, which is why our goal is to expand our sustainable mobility model to other parts of Mallorca. It’s an important social base, since Esporles is the municipality with the second highest number of Ecotxe members. 1. Sponsorship through Volunteer Social Capital (VSC) contributions. Currently VSC is paid at 1% interest. The interest rate is set annually at the co-op’s General Assembly. The VSC is 100% refundable at any moment pending board approval. This second option consists of buying prepaid hours that will be discounted each time you use one of our shared electric cars. With this option, you’ll receive a bonus of 10% extra hours with your purchase. For example, if you purchase 900€ of rental time, with the current tariff (4.50€/hr), you get 200 hours of use. However if you purchase the same amount in prepaid hours, you’ll receive an additional 20 hours for a grand total of 220. In order to participate in either option you must be a co-op member. There is a 100€ Mandatory Social Capital fee for all new members. This contribution can be refunded at any time. To cover the initial registration amount, 100€ will be deducted from all new member contributions. You can review the details and the risk factors at the end of this article. For potential new users of the service, the benefits of Ecotxe in Esporles are easy to see. However, it’s likely that other Esporles residents reading this article are asking themselves, “If I already own one or two cars that cover my transportation needs, why would I invest in this shared vehicle?” Even for non-users there are many reasons to join Ecotxe. If in the future you’d like your VSC contribution returned, you can opt out at any moment. We would purchase a Renault Zoe, which is the same model as the two other Ecotxe cars. It’s a model we know well and has autonomy for 300 km between charges. Our goal is to collect 30,000€, which are the funds needed to cover the initial purchase and associated costs. We have the support of the Esporles Town Hall who have offered us a free reserved parking spot in one of the town’s two car parks. 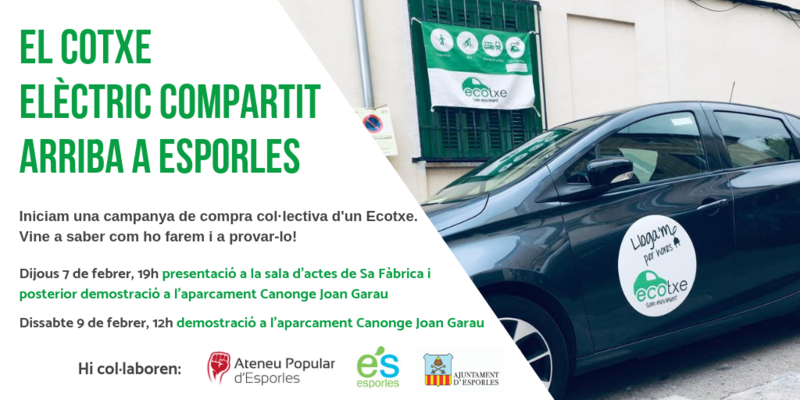 It should be mentioned that Esporles already has charging stations available (two in the Canonge Joan Garau parking lot and another two in Ca l’Amet) supplied with 100% renewable energy, which are currently free to use. Relying on renewable energy means an even higher reduction of pollutants. In Ecotxe we have a three-month timeline to raise the 30,000€ for the Esporles electric car. If at this point we haven’t yet reached our goal, we’ll reevaluate if we’ll continue fundraising. In the case that we decide not to, we’ll refund all participates who contributed towards the Esporles campaign. 30,000€ may seem like a lofty goal, but together we can make the first electric car sharing in Esporles possible! If you want to join the campaign, click on the link below. The final price includes all costs and VAT. For 8 to 24 hours of continuous use, users will be charged a full-day tariff. The purchased hours can be used for any car owned by the co-op. We will email you a receipt when you purchase a pack of prepaid hours. Type of interest: 1%. The General Assembly will review annually the type of interest that will be applied from January 1st to December 31st. Volunteer social capital contributions will remain in the co-op until the member asks for its return. In this case, refunds would be made within three months. Due to extraordinary conditions, the Management Board can decide to return social capital contributions to members without their prior request. The volunteer social capital contribution is an investment. The co-op will use the funds primarily to buy electric vehicles to offer the carsharing service. The investment is not covered by the Bank Guarantee Fund managed by the Bank of Spain. In the event that Ecotxe loses liquidity, outstanding balances will be paid in the following order of priority: Debts with the Administration, workers, loans, participative securities, volunteer social capital and finally mandatory social capital. We advise that you only invest the amount that you don’t need in the short to mid-term.